Watching ‘The Island with Bear Grylls’, it appears that apathy caused by culture shock can lead seamlessly to exhaustion from lack of food calories. Part of a Resilience Plan is to keep a small store of tinned and dried supplies. I recommend keeping enough for three weeks, if you have the space. Inspired to inspect my own collection, I found it was a bit haphazard and resolved to organise it. 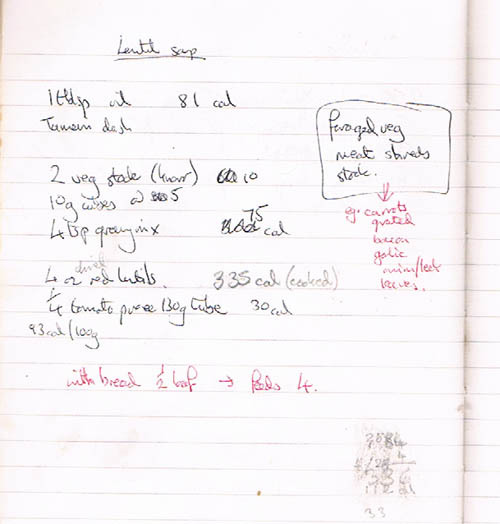 Counting calories and working out recipes…. I’ll have to write another book. The stores have to be rotated as sell by dates are reached. Check through them every three months, take out anything that needs used before the next check, rearrange and restock. Never store food you don’t like. Storage conditions are often far from ideal; lofts suffer from stifling summer heat and freezing winters. You couldn’t store butter, for example. If you ever need to rely on your stores, it’s useful to do some menu planning. Here’s one recipe..
A large pan. This recipe is easier to make in larger amounts. A tablespoon of cooking oil, some tamari (soy sauce). If you have any fresh meat or onion type vegetables to add, chop them up and lightly fry them. If you are lucky, you may have some stock; otherwise add hot water and a couple of stock cubes. Add about four ounces [112g] of dried red lentils. Don’t pre-soak them. How much liquid? Depends how many people you want to feed; this recipe is enough to fill four bowls. Remember the lentils will soak up some of it. If you have any root vegetables, put them in now. Grated carrot is nice. Stir. Bring it to a low boil, then turn the heat right down and let it simmer. Mind it doesn’t stick; pans with thick bottoms are best for this work. Stir in four teaspoons of instant gravy mix and a quarter 130g tube of tomato puree. Keep an eye on the sticking as the soup thickens. You can add more water at any point. Add any green leafy veg, shredded, just before the end. The soup is done when the lentils are soft, but can be kept simmering to wait for people for as long as you care to keep stirring it. This soup really needs to be kept in a cold place to last over two meals, so it’s best made fresh and left overs eaten early the next day. Without the added fresh food, this recipe provides an unimpressive 550 calories* between four. If you’re completely unable to access any other ingredients, increase the lentils. However, what of your neighbours who don’t have stores? Remember, freezers depend on electricity. Could they help you forage to add to the meal? Bacon goes very well with this recipe; it may be available after less thoroughly preserved meats have spoiled. A basic soup provides an expandable framework for a variety of fresh food. There’s quite a lot to it. Rocket leaves are good in salads. Once you are used to the slightly peppery taste, you may find ordinary lettuce too bland. It’s this taste which makes it resistant to slug attack. Rocket is easy to grow, and can be sown any time of year for a crop of fresh leaves. These contain the essential vitamin C not found in preserved foods. If sown in autumn, the plant will overwinter as a small form, about 20cm (8 inches) high, with many leaves. These are densely packed, providing good ground cover so that little weeding is required. You can use this as cut and come again for winter salads. Even if covered by snow, the plant can quickly regroup to produce more leaves. If it is protected from frost, you can browse on it all winter. When spring arrives, though, it will grow quickly, with long tough stems. Flowers, as shown in the picture, appear. The energy of the plant will be directed to seeding, so the leaves will gradually become tatty from the attacks of small pests. All parts of the plant remain edible, though, and the flowers make a pretty decoration for summer salads. The leaves become more fiddly to collect, so once the wild garlic is out and if you can use the space for more seasonal vegetables, dig up most of the rocket at this point. Leave the best looking plants to carry on flowering. They’ll produce seed, which you can harvest when the seed pods are dry. You can use this seed to sow your next crop of rocket. It is a prolific self seeder as well, so learn to distinguish these seedlings from inedible weeds. If you allowed any rocket to go to seed this spring, the seedlings will be coming up right now. Sowing on a different patch with saved seed can be left until September.